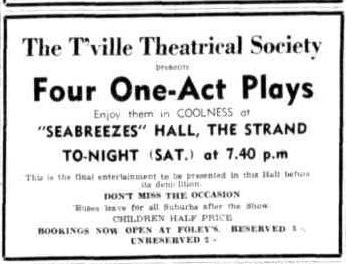 The second performance was on Thursday 4, Friday 5, Saturday 6 Dec 1947 at the Sea-Breezes Hall (the wartime RAAF Recreation Hall) on The Strand, opposite St Patrick’s College. 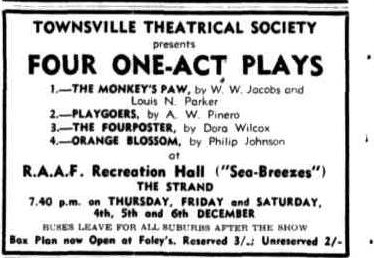 The performance consisted of 4 one-act plays “The Monkey’s Paw”, Playgoers”, The Fourposter”, “Orange Blossom”. I cannot recall a provincial city possessing such a wealth of acting-talent like Townsville can boast. The local Theatrical Society continues to produce new performers and the standard of stage work is remarkable. Even more remarkable, is the fact that the society manages to attract the artists. Usually, this is a most difficult task, as young people, especially, are loth to give up two or three nights each week for rehearsals. That is one reason why the players deserve every support the public can give them. They are lifting the city still higher on the public activity and cultural plane and are doing a faultless job. On the question of talent I will guarantee to select an entire cast from the members of the company and produce a show that could hold its own on any professional stage in the South. I know something of the theatre, and you can take it from me the talent available is extraordinary. One thing the Townsville Theatrical Society must do quickly, is to produce a full-length play. The shows so far have been excellent, and have performed their service of giving all the artists a chance to appear in public and gain experience, but for the living stage to become a regular unit in the city's entertainment field, full-length plays are essential. All of the artists could still have their chance to appear. The society has enough actors and actresses of proved ability to form two, or even three, companies. By presenting shows every three or four weeks, each company could be in rehearsal for its show while one was playing its current offering. This would have the much desired effect of giving those who like the living stage a continual source of entertainment. The society's players could even divide into specialised companies —one for drama, one for comedy, and one for farce. It is worth giving a thought.